There are gull tracks, and then there’s this…well, whatever it is…in the shape of a strange bird. Two avian references. 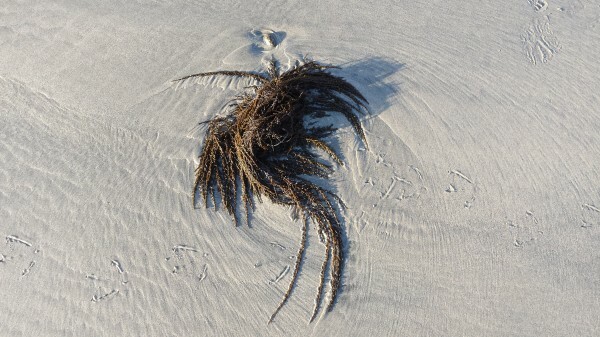 The seaweed arranges itself so beautifully that it is hard to remember that it is random. We spent a long time on the beach today, walking and looking and taking pictures, and the sun set with the teensiest of green flashes, and then it got so chilly that my ears hurt. Ear muffs? A 7-year-old boy with brilliant orange hair (giving me another moment of hair envy) explained to me that a mud pie looked solid but was really liquid. A non-Newtonian liquid, I told him, likening it to ketchup. Hm…quite something for a non-scientist to try to explain to a second-grader. But he was loving the beach for sure, his joy bursting from him in non-stop chatter and movement!